Hesperi et Phosphori nova phaenomena sive Observationes circa planetam Veneris. -- Rome: Apud Joannem Mariam Salvioni, 1728. It is curious that the first two good views of particular lunar features appeared in books devoted to subjects other than the moon. 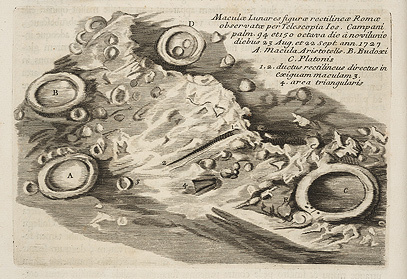 The first was Hooke's sketch of Hipparchus in a book on the microscope, and the next was this drawing of Plato and the Alpine Valley in a treatise on the planet Venus (the morning and evening star, Hesperus and Phosphorus). Bianchini's studies of Venus raised the vexing problem of deriving topography from shadow patterns, and this led him to the study of lunar craters. This small engraving, which appears in the text as part of the introductory chapter, shows the crater Plato at the right, with Aristotle and Eudoxus at left, and the mountain range of the Alps cut by the dramatic slash of the Alpine valley. Bianchini noted with surprise that the valley did not appear on the great Cassini map, and he was right; Bianchini was the first to see and to portray this most impressive of lunar valleys. Bianchini also observed that the crater at top center was pictured but not named on the Cassini map. He left it to his successor, Schröter, to take the next logical step and give it the name still used: Cassini.